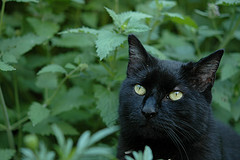 Catnip is a perennial herb in the mint family. It is also a distantly related to marijuana. It is native to Europe and Asia. It quickly became naturalized in America & Canada after it was introduced and is now a widespread weed in North America. This favorite of felines everywhere is also known by many names, including: Cataria, Catmint, Catrup, Cat's Heal All, Cat's-play, Catwort and Field Balm. When a cat encounters “The Green Herb” as I call it, he will usually sniff at it, rub it, roll all over it, kick at it, and generally go crazy for a few minutes. Eventually he will eat some of it. 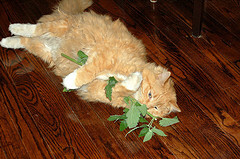 One little known fact is that when sniffed, catnip will stimulate kitty but when cats eat it, it has a sedative effect. The high produced by sniffing the green herb will usually last between five & ten minutes. Then the cat will lose interest and walk away. Then the cat acclimates to it, and it can take an hour or two away from catnip for the cat to "reset." Later on, the cat may come back and have exactly the same response. About half of domestic cats are affected by catnip, and each cat's response is a bit different. Most cats aren’t affected by it until 4 to 6 months of age. The chemical Nepetalactone is contained in the stems, leaves and flowers of the plant. Nepetalactone causes an hallucinogenic effect in cats. Luckily, it is not harmful to your cat. They won't overdose on it. Most cats know their limits and will refuse when they’ve had enough. Valerian (valerian root) also produces a similar reaction in cats. Valerian has a rather strong, unpleasant smell but cats love it. Just be prepared that it smells much better to them than to us. I mix a sprinkle of valerian in with the ‘nip I give my cat Spooky sometimes and he really does seem to get an even bigger kick out of it. This herb is often in magic spells to promote beauty and has also been used in cosmetics as a skin conditioning agent. Some other human uses are: Anesthetic, antibiotic, anti rheumatic, antispasmodic, astringent, carminative, diuretic, analgesic, rheumatism, chills, hemorrhoids and toothache. This almost miraculous herb tends to have a sedative effect on humans. It is most often drunk as a tea. Pour boiling water over dried leaves and let steep for five to seven minutes. I like to add some Chamomile or Spearmint to mine, although Lemongrass works well also. Sweeten to taste. This tea is useful for settling an upset stomach. It has also been used to treat headaches, scarlet fever, coughing, insomnia & smallpox. It should be noted that this herb has been suspected in causing problems with menstruation and pregnancy, so Pregnant women should avoid catnip. Many cats are crazy for a “bit-o-the-nip”, mine included. Freshly grown, it is a real favorite treat. Toys that incorporate it are a fun way to interact with your cat, and help him get the exercise he needs. Below, I've listed just a few of what I feel are the best of the ‘nip toys, and all have been approved by my team of feline product testers. This is one of the absolute best ‘nip toys ever. The stuffing is very potent and the scent lasts a long time. The nifty thing is, if you pick it up and give it a twist, you crush more essential oil from the leaves, and cats go crazy all over it again! Here’s a super fun kind of kitty treat! This wondrous invention is a toy and a treat, all rolled into one (pun intended). Made with the best organic herb and natural beeswax, the ingredients are compressed into a 1 ¼ inch ball, weighing over half an ounce! As with all toys which could represent a choking hazard, supervise your cat when he's playing with or eating the Paw Breaker. Spotnips Fur Mice are adorable furry mice that will keep your cat active for hours. While these don’t come with any herbs, just try putting some into your canister of catnip for a few days and then serve them up for playtime. The fur holds the scent and provides an appetizing texture as well. They're pretty durable too, since each one contains a plastic shell inside, and fur on the outside. My feline product testers love them so much, I have to constantly keep them in stock. Spooky plays with them, throws them up in the air, hides and then hunts them, and much later when he has finally stripped all the fur off of one, he has still more fun playing with the plastic core! 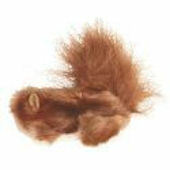 These synthetic fur "Cat Squirrels" come in several sizes and each one is filled with Kong Premium ‘nip, which has proven itself to me at least as good as the popular Yeowww! brand. The hidden velcro closure may be opened for easy refills. Spooky has one that he adores. Te poor thing has been pushed, pulled, dragged and thrown all over my house. It is like a teddy bear, something to be played with, cuddled, slept with and more. It's great for comforting new kittens too. This is a pure extract from fresh plants. Spray on toys, scratching posts and other objects to make your cat happy and frisky. If you don't like the mess of loose leaves on scratching posts and cat trees, this concentrated spray comes to the rescue. Pleasant-scented to humans, it is irresistible to cats, and the scent lasts a long time. Your cats will love everything you spray with it.